What’s really behind the Sony hack? “I’m so ronery!” « Hercules and the umpire. One TV station is telling us how inept The Kimster Kingdumb is, while another tells us to get under our beds and hide from the only thing worse than Obola (The Kimster Kingdumb). My money is on The Banksters on Wallster Street for doing the most damage (The Matrix of Plunder – 3) to pensions. Perhaps this is somewhat like the old polish joke (“Why on Earth did the Poles let the Germans march right in and take their country? Because the Germans walked in backwards so the Poles thought they were leaving.”). I think Americans might consider this in the context of their recent and future pension plunder. Don’t worry Judge RGK, the congress removed jurisdiction from courts to entertain suits against pension fund trustees when they plunder the pensions (ibid). Now everyone go get under the bed and listen for The Kimster Kingdumb sneaking around looking for movie theatres to torch. And our long isolation of the regime has led to the stunted growth of poor Kim “Bébé Doc” Jong-un. Today President Obama is promising “a proportionate” response to North Korea’s intrusion into our cyberspace. NPR notes a problem — that North Korea lacks any IT infrastructure worth retaliating against. As an alternative, I propose that we hit the North Koreans where it really hurts: a televised celebrity roast of the beloved leader. Censored speech leads to more speech. I like it. I like the roast idea a lot. I hear Stephen Colbert is available. Great idea. We could get Dennis Rodman to come I bet. 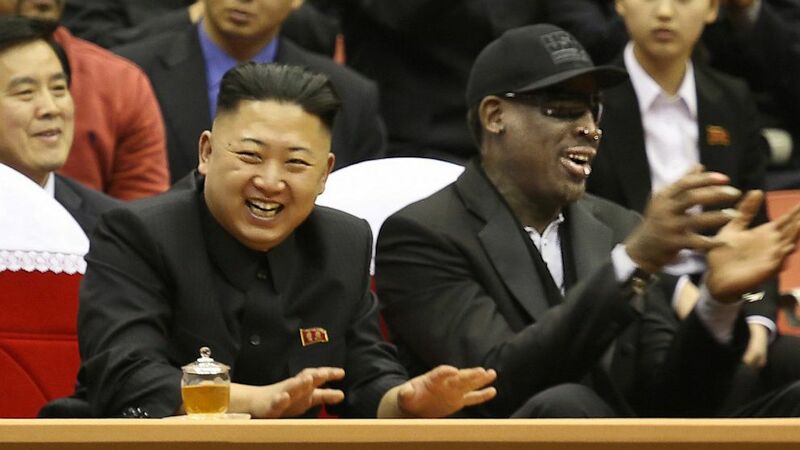 He could toast his friend for life, and give a funny speech about Pyongyang’s Hunger Games. North Korea now wants a joint effort together with the U.S. government, denying that they were involved (North Korea Calls For Joint Probe Into Sony Hacking, Says It Was Not Involved). And people in hell want ice water!